What a difference a good sleep makes! The River Spey (Scottish Gaelic: Uisge Spè) is a river in the northeast of Scotland. It is the ninth longest river in the United Kingdom, as well as the third longest and fastest-flowing river in Scotland. It is important for salmon fishing and whisky production (MKO’Note: Looks like my FB friend was right!). After taking the pictures, I napped a bit. I went to get something out of the fridge and found the power was off – and to the microwave. That was the fuse we’d blown last night. Tom found a stepladder and the fusebox. At 11:00 we went to the main building for a little talk about what to do here in Aviemore and the surrounding areas. We met Gina, the general manager, and Jean who has lived in Boat of Garten forever. When I mentioned we were going to the Edinburgh Tattoo on Wednesday, Jean said her partner’s father was Black Watch so he can wear the colors. 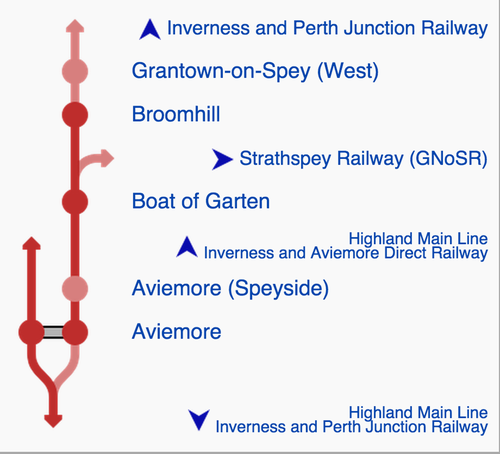 I asked about Strathspey Railway and CairnGorm Funicular. 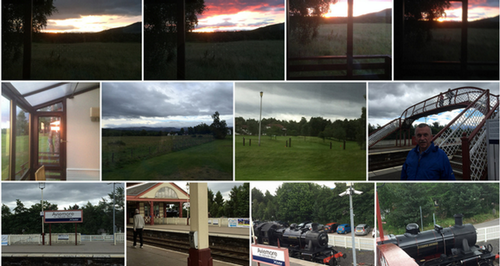 Jean said it was too foggy today for the funicular so we went to Strathspey Steam Railway. It goes from Aviemore to Broomhill by way of Boat of Garden. We walked down hill from our parking spot to the train station and over a bridge. I got some good pictures of the train from that bridge – and some photos of the engineer backing the train up. We were able to get tickets for a train leaving in about 15 minutes. For the way up to Broomhill, we sat near the front of the train. Our unique heritage railway boasts an incredible history and our line was the first to come to the Scottish Highlands, back in the mid 1800s. The future of our Railway is also of great importance! We’re working very hard to realise the railway’s dream of returning steam trains to Grantown-on-Spey! We went back up the hill to the MacDonald Hotel to gets something to eat but there was no open restaurant. A Trafalgar tour bus let some people off but they seemed to be the only ones in the hotel. We walked around complex. Nothing. Went in shopping center. No food. We did get a couple t-shirts so all was not lost. We walked back down the hill and into town. We stopped at the Cairngorm Hotel for a nice lunch. Coffee americano (Normal with 2 shots of espressos), of course. The coffee came with a small bit of shortbread (I think mine is better! ). I got the senior meal of roast lamb (I wondered if it was like the seafood restaurants where you can choose your lobster – if I could choose one of the sheep I saw from the train), new potatoes, potatoes which had been mashed, formed into an oval and lightly fried, puréed carrots (maybe senior meant can’t chew. I thought it was smaller portions). Gravy. And peas which I avoided. My meal came with dessert so I had sticky toffee pudding with butterscotch sauce, ice cream and whipped cream. Tom had an omelette with chips (french fries)…and peas. Ice cream for dessert came in a waffle cup with whipped cream and pirouette cookie. The buffet on Thursday features haggis so we probably won’t be back! Just a note here – sometimes, Cairngorm is spelled CairnGorm, sometimes Cairn Gorm, sometimes Cairngorm – all the same mountain as far as I can tell. At this point, I realized I hadn’t put big bandage over butterflies and I’d been walking all day. Hooray! We learned we couldn’t add a tip onto our charge bill for lunch. It had to be added before they ran the credit card. The waiter couldn’t take American money and the hotel staff couldn’t, either. They suggested changing money at the post office because it had a better rate than the banks. We went across the street to find an adaptor since the ones we brought weren’t working. Got one and headed home. Nap! I woke up about 7. Tom at 8. We found our new adaptor was for people going to the states from here. I got one of our original adaptors working and started charging phones. This adaptor was only good for 2 pronged plugs so we used it for USB connections only. We had another adaptor I’d bought specifically for this trip, as well as a 2-to-3 prong adaptor for the computers. I got very excited about this and set it up, plugging in an extension cord, then the 2-to-3, then plugged the adaptor into the wall. Too much – blew that out. <sigh> Now we can’t recharge the computers. We went out for a little walk, then had spaghetti for dinner. A Sinatra pretender on BBC Proms.